"English bank" redirects here. For banking in England, see Banking in the United Kingdom. For the corpus linguistics project, see Bank of English. The Bank of England is the central bank of the United Kingdom and the model on which most modern central banks have been based. Established in 1694 to act as the English Government's banker, and still one of the bankers for the Government of the United Kingdom, it is the world's eighth-oldest bank. It was privately owned by stockholders from its foundation in 1694 until it was nationalised in 1946. The Bank became an independent public organisation in 1998, wholly owned by the Treasury Solicitor on behalf of the government, but with independence in setting monetary policy. The Bank is one of eight banks authorised to issue banknotes in the United Kingdom, has a monopoly on the issue of banknotes in England and Wales and regulates the issue of banknotes by commercial banks in Scotland and Northern Ireland. The Bank's Monetary Policy Committee has a devolved responsibility for managing monetary policy. The Treasury has reserve powers to give orders to the committee "if they are required in the public interest and by extreme economic circumstances", but such orders must be endorsed by Parliament within 28 days. The Bank's Financial Policy Committee held its first meeting in June 2011 as a macroprudential regulator to oversee regulation of the UK's financial sector. The Bank's headquarters have been in London's main financial district, the City of London, on Threadneedle Street, since 1734. It is sometimes known as The Old Lady of Threadneedle Street, a name taken from a satirical cartoon by James Gillray in 1797. The road junction outside is known as Bank junction. As a regulator and central bank, the Bank of England has not offered consumer banking services for many years, but it still does manage some public-facing services such as exchanging superseded bank notes. Until 2016, the bank provided personal banking services as a privilege for employees. England's crushing defeat by France, the dominant naval power, in naval engagements culminating in the 1690 Battle of Beachy Head, became the catalyst for England rebuilding itself as a global power. England had no choice but to build a powerful navy. No public funds were available, and the credit of William III's government was so low in London that it was impossible for it to borrow the £1,200,000 (at 8% p.a.) that the government wanted. To induce subscription to the loan, the subscribers were to be incorporated by the name of the Governor and Company of the Bank of England. The Bank was given exclusive possession of the government's balances, and was the only limited-liability corporation allowed to issue bank notes. The lenders would give the government cash (bullion) and issue notes against the government bonds, which can be lent again. The £1.2m was raised in 12 days; half of this was used to rebuild the navy. As a side effect, the huge industrial effort needed, including establishing ironworks to make more nails and advances[clarification needed] in agriculture feeding the quadrupled strength of the navy, started to transform the economy. This helped the new Kingdom of Great Britain – England and Scotland were formally united in 1707 – to become powerful. The power of the navy made Britain the dominant world power in the late 18th and early 19th centuries. 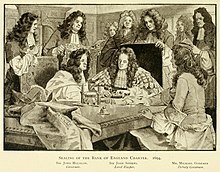 The establishment of the bank was devised[clarification needed] by Charles Montagu, 1st Earl of Halifax, in 1694. The plan of 1691, which had been proposed by William Paterson three years before, had not then been acted upon. 58 years earlier, in 1636, Financier to the king, Philip Burlamachi, had proposed exactly the same idea in a letter addressed to Sir Francis Windebank. He proposed a loan of £1.2m to the government; in return the subscribers would be incorporated as The Governor and Company of the Bank of England with long-term banking privileges including the issue of notes. The royal charter was granted on 27 July through the passage of the Tonnage Act 1694. Public finances were in such dire condition at the time that the terms of the loan were that it was to be serviced at a rate of 8% per annum, and there was also a service charge of £4,000 per annum for the management of the loan. The first governor was Sir John Houblon, who is depicted in the £50 note issued in 1994. The charter was renewed in 1742, 1764, and 1781. Satirical cartoon protesting against the introduction of paper money, by James Gillray, 1797. 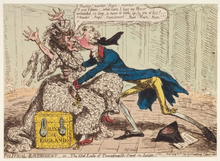 The "Old Lady of Threadneedle St" (the Bank personified) is ravished by William Pitt the Younger. The Bank's original home was in Walbrook, a street in the City of London, where during reconstruction in 1954 archaeologists found the remains of a Roman temple of Mithras (Mithras is – rather fittingly – said to have been worshipped as, amongst other things, the God of Contracts); the Mithraeum ruins are perhaps the most famous of all 20th-century Roman discoveries in the City of London and can be viewed by the public. When the idea and reality of the national debt came about during the 18th century, this was also managed by the Bank. During the American war of independence, business for the Bank was so good that George Washington remained a shareholder throughout the period. By the charter renewal in 1781 it was also the bankers' bank – keeping enough gold to pay its notes on demand until 26 February 1797 when war had so diminished gold reserves that – following an invasion scare caused by the Battle of Fishguard days earlier – the government prohibited the Bank from paying out in gold by the passing of the Bank Restriction Act 1797. This prohibition lasted until 1821. The 1844 Bank Charter Act tied the issue of notes to the gold reserves and gave the Bank sole rights with regard to the issue of banknotes. Private banks that had previously had that right retained it, provided that their headquarters were outside London and that they deposited security against the notes that they issued. A few English banks continued to issue their own notes until the last of them was taken over in the 1930s. Scottish and Northern Irish private banks still have that right. The bank acted as lender of last resort for the first time in the panic of 1866. The last private bank in England to issue its own notes was Thomas Fox's Fox, Fowler and Company bank in Wellington, which rapidly expanded, until it merged with Lloyds Bank in 1927. They were legal tender until 1964. There are nine notes left in circulation; one is housed at Tone Dale House Wellington. Britain remained on the gold standard until 1931, when the gold and foreign exchange reserves were transferred to the Treasury; however, they continued to be managed by the Bank. During the governorship of Montagu Norman, from 1920 to 1944, the Bank made deliberate efforts to move away from commercial banking and become a central bank. In 1946, shortly after the end of Norman's tenure, the bank was nationalised by the Labour government. The Bank pursued the multiple goals of Keynesian economics after 1945, especially "easy money" and low interest rates to support aggregate demand. It tried to keep a fixed exchange rate, and attempted to deal with inflation and sterling weakness by credit and exchange controls. In 1977, the Bank set up a wholly owned subsidiary called Bank of England Nominees Limited (BOEN), a private limited company, with two of its hundred £1 shares issued. According to its Memorandum & Articles of Association, its objectives are: "To act as Nominee or agent or attorney either solely or jointly with others, for any person or persons, partnership, company, corporation, government, state, organisation, sovereign, province, authority, or public body, or any group or association of them...." Bank of England Nominees Limited was granted an exemption by Edmund Dell, Secretary of State for Trade, from the disclosure requirements under Section 27(9) of the Companies Act 1976, because "it was considered undesirable that the disclosure requirements should apply to certain categories of shareholders." The Bank of England is also protected by its royal charter status, and the Official Secrets Act. BOEN is a vehicle for governments and heads of state to invest in UK companies (subject to approval from the Secretary of State), providing they undertake "not to influence the affairs of the company". BOEN is no longer exempt from company law disclosure requirements. Although a dormant company, dormancy does not preclude a company actively operating as a nominee shareholder. BOEN has two shareholders: the Bank of England, and the Secretary of the Bank of England..
On 6 May 1997, following the 1997 general election that brought a Labour government to power for the first time since 1979, it was announced by the Chancellor of the Exchequer, Gordon Brown, that the Bank would be granted operational independence over monetary policy. Under the terms of the Bank of England Act 1998 (which came into force on 1 June 1998), the Bank's Monetary Policy Committee was given sole responsibility for setting interest rates to meet the Government's Retail Prices Index (RPI) inflation target of 2.5%. The target has changed to 2% since the Consumer Price Index (CPI) replaced the Retail Prices Index as the Treasury's inflation index. If inflation overshoots or undershoots the target by more than 1%, the Governor has to write a letter to the Chancellor of the Exchequer explaining why, and how he will remedy the situation. The success of inflation targeting in the United Kingdom has been attributed to the Bank's focus on transparency. The Bank of England has been a leader in producing innovative ways of communicating information to the public, especially through its Inflation Report, which have been emulated by many other central banks. The handing over of monetary policy to the Bank had been a key plank of the Liberal Democrats' economic policy since the 1992 general election. Conservative MP Nicholas Budgen had also proposed this as a private member's bill in 1996, but the bill failed as it had the support of neither the government nor the opposition. Mark Carney assumed the post of Governor of the Bank of England on 1 July 2013. He succeeded Mervyn King, who took over on 30 June 2003. Carney, a Canadian, will serve an initial five-year term rather than the typical eight. He became the first Governor not to be a UK citizen, but has since been granted citizenship. At Government request, his term was extended to 2019, then again to 2020.. As of January 2014, the Bank also has four Deputy Governors. Bank House, the Bank of England offices on King Street in Leeds. Note: It is important to note that "monetary" and "financial" are synonyms. Maintaining financial stability involves protecting against threats to the whole financial system. Threats are detected by the Bank's surveillance and market intelligence functions. The threats are then dealt with through financial and other operations, both at home and abroad. In exceptional circumstances, the Bank may act as the lender of last resort by extending credit when no other institution will. Other central banks and international organisations, with the aim of improving the international financial system. The 1997 memorandum of understanding describes the terms under which the Bank, the Treasury and the FSA work toward the common aim of increased financial stability. In 2010 the incoming Chancellor announced his intention to merge the FSA back into the Bank. As of 2012, the current director for financial stability is Andy Haldane. The Bank acts as the government's banker, and it maintains the government's Consolidated Fund account. It also manages the country's foreign exchange and gold reserves. The Bank also acts as the bankers' bank, especially in its capacity as a lender of last resort. Since 1998, the Monetary Policy Committee (MPC) has had the responsibility for setting the official interest rate. However, with the decision to grant the Bank operational independence, responsibility for government debt management was transferred in 1998 to the new Debt Management Office, which also took over government cash management in 2000. Computershare took over as the registrar for UK Government bonds (gilt-edged securities or gilts) from the Bank at the end of 2004. The Bank used to be responsible for the regulation and supervision of the banking and insurance industries. This responsibility was transferred to the Financial Services Authority in June 1998, but after the financial crises in 2008 new banking legislation transferred the responsibility for regulation and supervision of the banking and insurance industries back to the Bank. In 2011 the interim Financial Policy Committee (FPC) was created as a mirror committee to the MPC to spearhead the Bank's new mandate on financial stability. The FPC is responsible for macro prudential regulation of all UK banks and insurance companies. To help maintain economic stability, the Bank attempts to broaden understanding of its role, both through regular speeches and publications by senior Bank figures, a semiannual Financial Stability Report, and through a wider education strategy aimed at the general public. It currently maintains a free museum and ran the Target Two Point Zero competition for A-level students, closing in 2017. Until the mid-19th century, commercial banks were allowed to issue their own banknotes, and notes issued by provincial banking companies were commonly in circulation. The Bank Charter Act 1844 began the process of restricting note issue to the Bank; new banks were prohibited from issuing their own banknotes and existing note-issuing banks were not permitted to expand their issue. As provincial banking companies merged to form larger banks, they lost their right to issue notes, and the English private banknote eventually disappeared, leaving the Bank with a monopoly of note issue in England and Wales. The last private bank to issue its own banknotes in England and Wales was Fox, Fowler and Company in 1921. However, the limitations of the 1844 Act only affected banks in England and Wales, and today three commercial banks in Scotland and four in Northern Ireland continue to issue their own banknotes, regulated by the Bank. UNITED KINGDOM OF GREAT BRITAIN AND IRELAND – Currency notes are Legal Tender for the payment of any amount – Issued by the Lords Commissioners of His Majesty's Treasury under the Authority of Act of Parliament (4 & 5 Geo. V c.14). Treasury notes were issued until 1928, when the Currency and Bank Notes Act 1928 returned note-issuing powers to the banks. The Bank of England issued notes for ten shillings and one pound for the first time on 22 November 1928. During the Second World War the German Operation Bernhard attempted to counterfeit denominations between £5 and £50, producing 500,000 notes each month in 1943. The original plan was to parachute the money into the UK in an attempt to destabilise the British economy, but it was found more useful to use the notes to pay German agents operating throughout Europe. Although most fell into Allied hands at the end of the war, forgeries frequently appeared for years afterwards, which led banknote denominations above £5 to be removed from circulation. In 2006, over £53 million in banknotes belonging to the Bank was stolen from a depot in Tonbridge, Kent. Modern banknotes are printed by contract with De La Rue Currency in Loughton, Essex. The Bank is custodian to the official gold reserves of the United Kingdom and around 30 other countries. The vault, beneath the City of London, covers a floor space greater than that of the fourth-tallest building in the City, Tower 42, and needs keys that are three feet (91 cm) long to open. As of April 2016, the Bank held around 400,000 bars, which is equivalent to 5,134 tonnes of gold. These gold deposits were estimated in August 2018 to have a current market value of approximately £200 billion. These estimates suggest the vault could hold as much as 3% of the gold mined throughout human history. The Governor serves for a period of eight years, the Deputy Governors for five years, and the non-executive members for up to four years. Since 2013, the Bank has had a chief operating officer (COO). As of 2015[update], the Bank's COO has been Charlotte Hogg. As of 2014[update], the Bank's chief economist is Andrew Haldane. Representing the Bullionist perspective, Economist David Ricardo argued that the Bank of England caused inflation and depreciation of the pound by over-issuing banknotes to purchase government securities because of the 1797 suspension of convertibility of pound into specie. The convertibility was suspended to prevent widespread conversion of banknotes into specie as the likelihood of war between England and France grew and fears of a French invasion increased. Before 1797, banknotes issued by the Bank of England were required to be convertible into specie. In the end, Ricardo won with his recommendation to return to convertibility to prevent further conflicts and to ensure price stability. The suspension remained in effect until 1821. After convertibility was reinstated in 1821, the discussion shifted to the Currency-Banking Controversy. ^ Bank of England (2 August 2018). "Monetary Policy Committee voted unanimously to raise Bank Rate to 0.75%". Retrieved 2 August 2018. ^ "House of Commons Debate 29th October 1945, Second Reading of the Bank of England Bill". Hansard.millbanksystems.com. Retrieved 12 October 2012. ^ "Bank of England Act 1946" (PDF). Retrieved 12 October 2012. ^ "Freedom of Information – disclosures". Bank of England. Retrieved 29 September 2013. ^ "BBC On This Day - 6-1997: Brown sets Bank of England free". Retrieved 14 September 2014. ^ "Bank of England - About the Bank". Archived from the original on 31 December 2014. Retrieved 14 September 2014. ^ "Bank of England: Relationship with Parliament". Archived from the original on 8 July 2009. Retrieved 14 September 2014. ^ a b "The Bank of England's Role in Regulating the Issue of Scottish and Northern Ireland Banknotes". Bank of England website. Retrieved 31 October 2011. ^ Bank of England, "Who is The Old Lady of Threadneedle Street?". Accessed 15 January 2018. ^ "Exchanging for an individual at the Bank of England counter". Bank of England. Retrieved 8 November 2016. ^ Topham, Gwyn. "Bank of England to close personal banking service for employees". The Guardian. Retrieved 8 November 2016. ^ Bagehot, Walter (1873). Lombard Street : a description of the money market. London: Henry S. King and Co.
^ Committee of Finance and Industry 1931 (Macmillan Report) description of the founding of Bank of England. 1 January 1979. ISBN 9780405112126. Retrieved 10 May 2010. "Its foundation in 1694 arose out the difficulties of the Government of the day in securing subscriptions to State loans. Its primary purpose was to raise and lend money to the State and in consideration of this service it received under its Charter and various Act of Parliament, certain privileges of issuing bank notes. The corporation commenced, with an assured life of twelve years after which the Government had the right to annul its Charter on giving one year's notice. '''Subsequent extensions of this period coincided generally with the grant of additional loans to the State'''"
^ III, Kenneth E. Hendrickson (25 November 2014). The Encyclopedia of the Industrial Revolution in World History. Rowman & Littlefield. ISBN 9780810888883. ^ "MITHRA i. MITRA IN OLD INDIAN – Encyclopaedia Iranica". www.iranicaonline.org. Retrieved 20 September 2016. ^ "Bank of England: Buildings and Architects". The Bank of England. Archived from the original on 10 September 2015. Retrieved 31 July 2015. ^ "The many, often competing, jobs of the Bank of England". The Economist. 16 September 2017. ^ "From lender of last resort to global currency? Sterling lessons for the US dollar". VOX. 23 July 2011. Retrieved 8 May 2014. ^ "27 July 1694: the Bank of England is created by Royal Charter". MoneyWeek. 27 July 2015. Retrieved 2 January 2018. ^ "Proceedings of the House of Commons, 21st April 1977". ^ "Guardian article on Queen's private wealth, 30th May 2002". The Guardian. London. 30 May 2002. ^ "Proceedings of the House of Lords, 26th April 2011". ^ "Bank of England Nominees Company Accounts". ^ "Example of a Dormant Nominee Company". ^ "Freedom of Information Act response regarding Bank of England Nominees Limited" (PDF). ^ The Scourge of Monetarism. Oxford University Press. 1 January 1982. ISBN 9780198771876. Retrieved 19 August 2016. ^ Sattler, Thomas; Brandt, Patrick T.; Freeman, John R. (April 2010). "Democratic accountability in open economies". Quarterly Journal of Political Science. 5 (1): 71–97. CiteSeerX 10.1.1.503.6174. doi:10.1561/100.00009031. ^ "Targeting Inflation: The United Kingdom in Retrospect" (PDF). IMF. Retrieved 31 October 2016. ^ "Inflation Targeting Has Been A Successful Monetary Policy Strategy". National Bureau of Economic Research. Retrieved 31 October 2016. ^ The Return of the Master. Public Affairs. 2009. ISBN 978-1610390033. Retrieved 19 August 2016. ^ Walters, A.A. (June 1971). "Consistent expectations, distributed lags and the quantity theory". The Economic Journal. 81 (322): 273–281. doi:10.2307/2230071. JSTOR 2230071. ^ "Mark Carney named new Bank of England governor". BBC. 26 November 2012. Retrieved 26 November 2012. ^ "The Bank's core purposes" (PDF). Annual Report 2011. Bank of England. Retrieved 24 October 2011. ^ Bank of England – Yield Curves by Internet Archive. ^ "Memorandum of Understanding between the HM Treasury, the Bank of England and the Financial Services Authority" (PDF). Archived from the original (PDF) on 3 December 2010. Retrieved 10 May 2010. ^ "Sale of Bank Note Printing". Bank of England. Retrieved 10 June 2006. ^ "Bank of England: Education". Bank of England. Archived from the original on 29 March 2007. Retrieved 28 March 2007. ^ a b "Asset Purchase Facility". Bank of England. Archived from the original on 26 July 2010. Retrieved 12 August 2010. ^ "£2 note issued by Evans, Jones, Davies & Co". British Museum. Archived from the original on 18 January 2012. Retrieved 31 October 2011. ^ "Fox, Fowler & Co. £5 note". British Museum. Archived from the original on 2 October 2011. Retrieved 31 October 2011. ^ Trevor R Howard. "Treasury notes". Archived from the original on 5 December 2007. Retrieved 12 October 2007. ^ "Record £53m stolen in depot raid". Retrieved 14 September 2014. ^ "Banknote Production". bankofengland.co.uk. Bank of England. Archived from the original on 10 March 2012. ^ Hanlon, Mike (22 October 2008). "The Big Picture: This vast vault of gold under the Bank of England should weather the credit crunch". Daily Mail. London. ^ Belton, Pádraig (19 April 2016). "The city with $248 billion beneath its pavement". BBC. ^ "Governors of the Bank of England: A chronological list (1694 – present)" (PDF). Bank of England. Retrieved 17 July 2014. ^ "Court of Directors". Bank of England. Retrieved 8 January 2018. ^ Court of Directors Website der Bank of England. Accessed 5 March 2019. ^ "News Release - Appointment of Chief Operating Officer". Bank of England. 18 June 2013. Retrieved 3 September 2015. ^ "Charlotte Hogg - Chief Operating Officer". Bank of England. Retrieved 26 August 2015. ^ "Bank of England Keeps Rates Steady". ABC News. Associated Press. 22 October 2014. ^ "Economic Ideas: David Ricardo on Wealth, Inflation, and Freedom - The Future of Freedom Foundation". www.fff.org. Retrieved 5 July 2018. Kynaston, David. 2017. Till Time’s Last Sand: A History of the Bank of England, 1694-2013. Bloomsbury.